Shopper Approved is a customer review management software that allows users to collect and promote customer reviews of their business or product. This extension is a cloud-based product that can be used to display reviews on websites, social media profiles, or any other landing page. 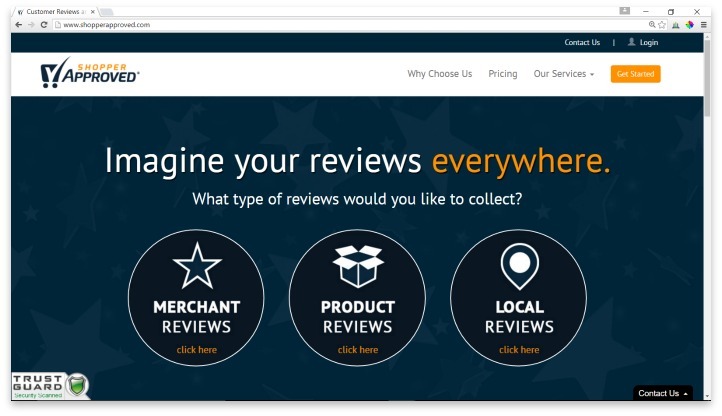 Since opening in 2010, Shopper Approved has expanded from merchant reviews, to product reviews and local reviews, which allows for targeted reviews to be shown to browsers from a particular geographic region. Third-party review management tools allow users to gather customer reviews from all over the Internet, and display them in a single spot on a central website or user profile. Shopper Approved makes this process very easy. Users don’t have to upload anything, install anything, or work with any internal databases – they simply have to add a line of code to the page they want the extension to show up on. Then Shopper Approved walks users through tutorials that set up automated review collection and display activities. However, Shopper Approved has a few extra tools that make it even more valuable. It allows users to create customized surveys in promotional emails and on their websites; it synchronizes with social media for extended reach; and it allows businesses to put certifications and seals on a website, simply by editing the extension, rather than the whole site. The good news is that Shopper Approved searches through and collects approximately 70% of all reviews listed online for your business or product. Their pricing, while not necessarily at the bottom of the ladder, is by far the most transparent of any review management system: the lowest tier starts at $49 per month, and gets you all the features of Shopper Approved, and will accumulate 300 reviews. They also offer a 30-day free trial run, so you can see for yourself how the product works. From there, the tiers go up, to $83 per month with 600 reviews, $99 per month with 900 reviews, and so on, until the highest corporate level of $599 per month with 10,000 reviews. An enterprise with more needs must call for a quote. Shopper Approved is a straightforward product. The display isn’t fancy, and can’t be customized or redesigned. It’s laid out in a way that maximizes readability, but some users may not enjoy the utilitarian look. Some may even find it a little dated. For others, this particular feature may be just what they need. Some users report having to call customer service more than once in order to go through a troubleshooting process after attempting to integrate third-party information. Shopper Approved does not offer a troubleshooting guide in their knowledge base, which is fairly scarce on technical questions of any sort. Shopper Approved is a cloud-based customer review management software that allows users to collect and promote customer reviews of their business or product. Overall, Shopper Approved is a great resource for businesses that want a no-fuss extension to show off some great reviews on their website. This probably isn’t the best option for a business that thrives on a modern, up-to-the-minute image, but for everyone else, Shopper Approved will get the job done. Their transparent pricing plans and 30-day free trial make them even more attractive, and they have just enough extra features to make the extension useful without straying too far from its original purpose. Have you had an experience with this company? Please share your Shopper Approved reviews below. Awesome service. We’ve utilized several customer review management software programs in the past and Shopper Approved is as good as it gets.